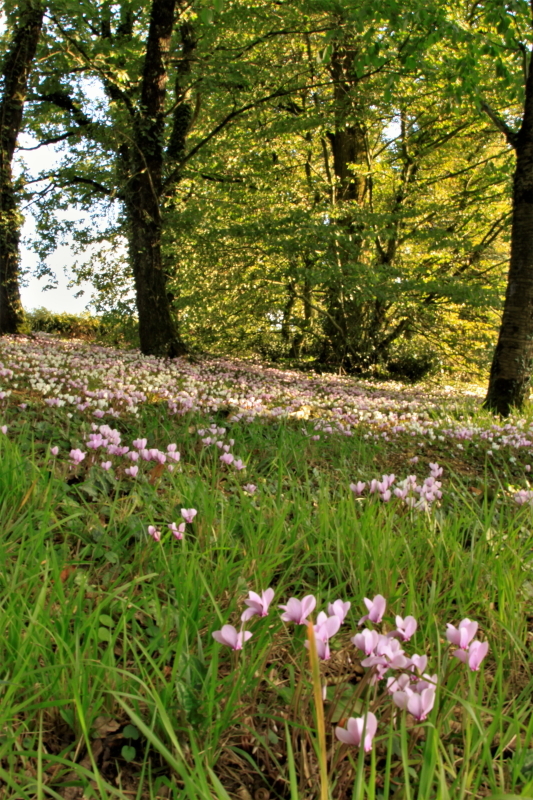 Sowbread is a wild cyclamen. 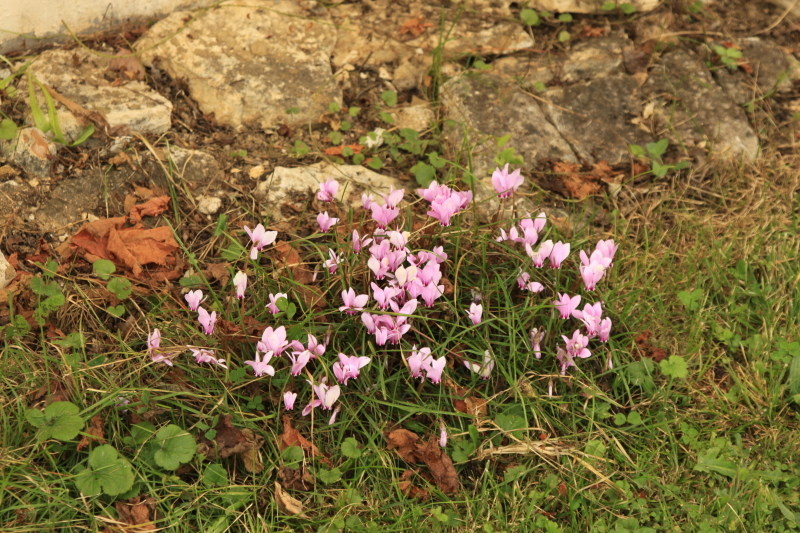 They flower in the Autumn and have pink or occasionally white flowers. It sounds like an odd name but the derivation is that supposedly pigs and wild boar will up root the corms and eat them. So it is bread (food) for sows. OK I prefer wild cyclamen. Having said that it is highly toxic to humans and some other animals, so I am not sure that pigs will actually eat the corms. 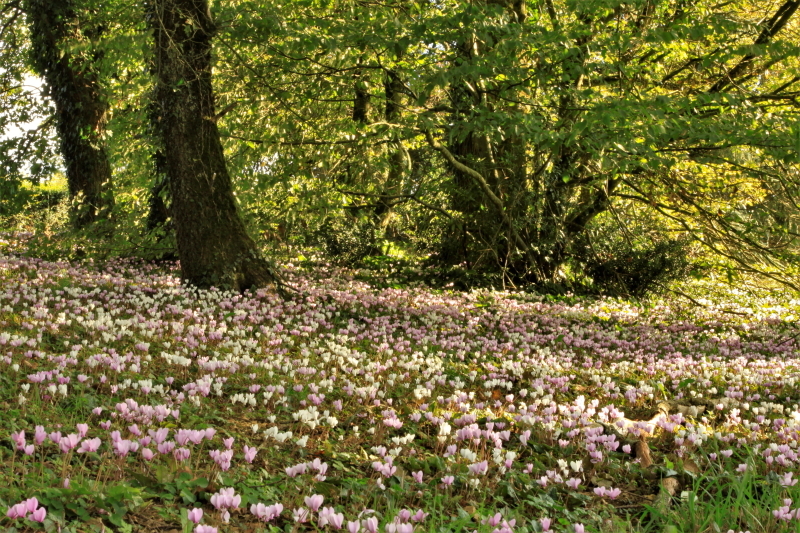 Cyclamen hederifolium was introduced into Britain before 1596, and seems to be increasingly frequent in woodlands and hedgerows near to, or as a relic of, former cultivation. It was apparently first recorded from the wild as early as 1597. Originally it came from southern Europe and Turkey. It is found in the Wye valley and nearby areas the BSBI has it recorded in tetrads just south of Symonds Yat, Chepstow and Tutshill, and in the Goodrich area. This plant adapts well to living in lawns, I have quite a lot of it growing in a lawn in France. The reason for this is that this cyclamen has a tuber, from which the leaves, flowers and roots grow. The leaves come up in autumn, grow through the winter, and then die in spring, then the plant goes dormant through the summer and then in the early autumn it flowers. So the leaves are present during the period of the year when you are not mowing your lawn and thus it can survive. Rather oddly the roots do not grow out of the underside of the corm, they grow from the top and then bend over and grow down into the soil. This rather confused me when I dug some up to move them to another part of my garden, but I worked it out before I replanted them so I did not plant them the wrong way up. Another interesting feature of this plant is that when the seeds are produced the stalk on which the seed is attached bends downwards and grows in a spiral way, thus cork screwing the seed into the ground. Also ants will sometimes collect the seeds and take them some distance from the plant, thus aiding their distribution. This is technically called, Myrmecochory. Several woodland plants rely on ants to help their dispersal. Some plants actually have a little lump on the seed called an elaiosome which is food for the ants. In the case of this cyclamen the seeds are covered with a sticky substance that the ants like and this is why they carry them off… all very clever stuff. The plant is quite poisonous and contains a highly toxic saponin, named cyclamin. Even in small doses this will paralyze fish, and fishermen in Sicily used the root tubers to stun fish making it easy to catch them by hand.